It’s really not such a stretch. 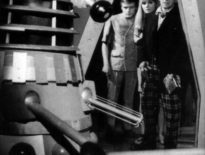 The associations between Patrick Troughton’s Doctor and Matt Smith’s are well-documented – the latter cites the former as a prime influence, and various articles have been written comparing the two. Unfortunately, most of them don’t venture beyond the superficial: the Second Doctor wore a bow tie, one says, and so does the Eleventh. 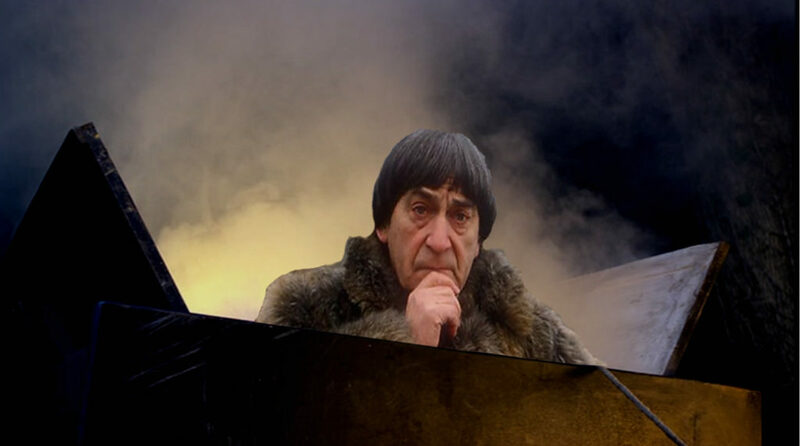 The Second Doctor faced the Great Intelligence (twice) who then disappeared off the books until The Snowmen. And, um, they both travelled with Scottish people. But there must be more to it than that, surely? 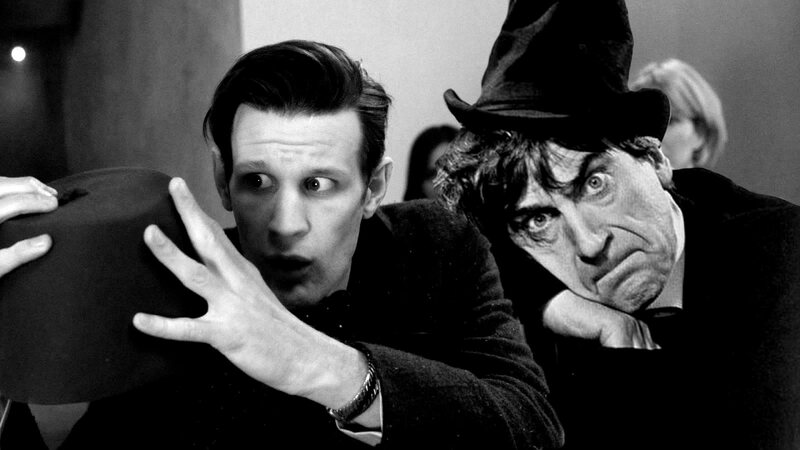 And there is, because – as we’ll see – the Eleventh Doctor is, to a considerable extent, the Second Doctor. But probably not the one you were expecting. 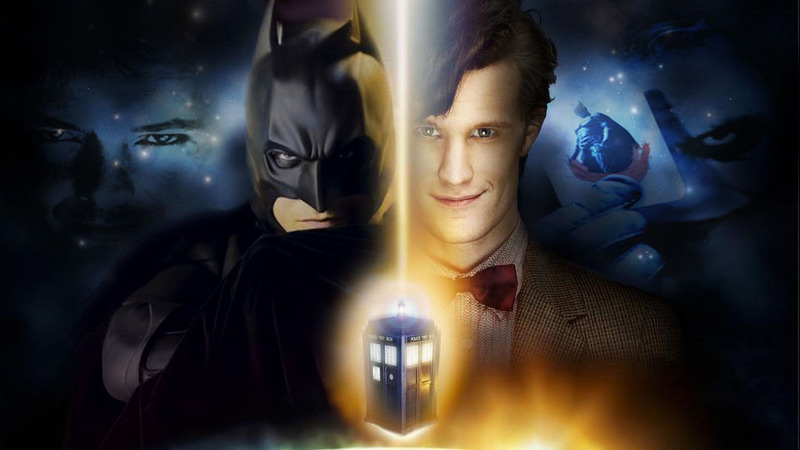 Costume aside, there’s a physicality that distinguishes the Doctor’s various incarnations. Hartnell does that thing with his lapels. Pertwee is debonair and distinguished, a man of conservative body language, relying on acts of sudden, Bond-like exertion. Davison is thoughtful and considered; Eccleston is forever prone, always slightly awkward, a fish out of water who ‘doesn’t do domestic’. T. Baker runs with a hand fixed firmly to the crown of his Fedora, leaping in great gambolling strides. And Tennant will intersperse periods of controlled, almost zen-like contemplation with sudden bursts of energy, moving back and forth and gesticulating like an airline steward on amphetamines. But look carefully and you’ll see a shared connection between Troughton and Smith – not so much when Smith is running in earnest, as he retreats in slow motion from a crashing spaceship or an exploding Dalek prison, but when he tumbles through Leadworth, pursued by demonic pensioners, or lurching through an out-of-control passenger jet halfway through The Bells of Saint John. It’s the same sort of maniacal lurching that you see from Troughton at the end of The Invasion: a man, you sense, who is not entirely in control of himself, but who manages to get the job done anyway. 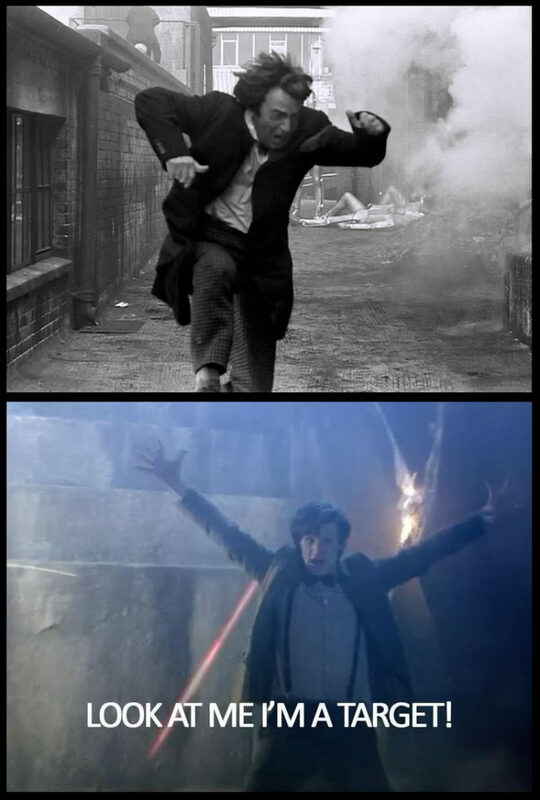 It’s often said that Smith acts with his whole body; the same is true of Troughton, when it suits him. That’s the outside, but what lies beneath? One of the things I really liked about Smith, at least in his first series, was that sense of otherworldly superiority. That’s always a given with the Doctor, but it’s also fair to say that some incarnations are more alien than others. Almost from the very beginning of Smith’s tenure you got the sense of someone not from this planet – the smartest person in the room, but who doesn’t brag about it simply because such thoughts wouldn’t have crossed his mind (something that cannot be said of Tennant). It’s an intellectual headway that comes at the expense of his humanity: Smith’s Doctor is both clever and clueless, frequently having no idea of what’s going on, particularly in his dealings with ‘grounded’ people like Craig and Rory. When you watch those early Eleventh Doctor stories again, it’s this sense of aloofness that stands out: The Lodger is the classic ‘alien’ Doctor, but even as early as The Eleventh Hour we’re presented with a man who is three steps ahead of everyone with one foot and two steps behind them with the other. The Eleventh Doctor thinks nothing of arranging complicated plots without letting anyone know about it, disappearing in the TARDIS without telling anyone where he’s going, and asking others to hug his companions while he messes around with a screwdriver. This is a man who explains things only when it suits him – not out of any darker designs, but simply because it hadn’t occurred to him to do so. Similarly, Troughton’s incarnation skirts around the issue of what’s happened to him, how it’s happened, and even, in The Power of the Daleks, whether or not he is the Doctor. It’s tempting, in analysing these early sequences, to ascribe this to one of those clever schemes whereby he allows his companions to come to their own conclusions without his help, but the truth may be far less complicated: regeneration lore was not what it was, explanations are scant because none were needed, and Troughton’s Doctor is flippant to the point of irritation because it suited the actor to be as different to Hartnell as the confines of the character would allow. 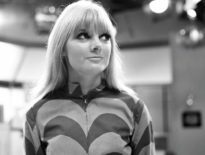 In many respects – particularly when compared to their immediate predecessors – both Second and Eleventh Doctors carry the air of an extraterrestrial Nero, fiddling while Rome burns (and the First Doctor watches the whole thing from a nearby hill). 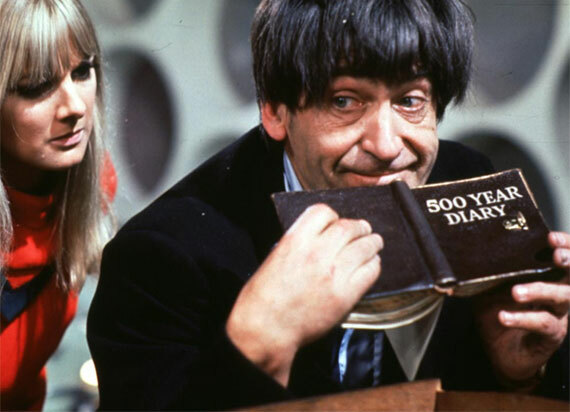 It’s a factor even in those very first stories – while a frustrated Ben and Polly discuss their captivity, Troughton plays with his recorder; back on Earth, Amy and Rory regard the incoming Atraxi with increasing concern while the Doctor is picking out his wardrobe. Both distractions have their purpose (the Second Doctor’s “Concentrate on one thing…” works on a number of levels), although it is not always obvious to the companions (or to the audience), and in a way it’s a shame that rather more is made of these than is perhaps necessary: in other words, it’s more fun to have a Doctor who is simply aloof, rather than a Doctor who is pretending to be aloof, but is secretly plotting. It’s not that simple, of course. There are numerous hints throughout that the Eleventh Doctor is only too conscious of the blood on his hands, and that this aloofness is a coping strategy – witness his off-handed remarks to House in The Doctor’s Wife, or Amy’s assessment of him in The Beast Below. The very next episode, he’s waving a Jammie Dodger at a Dalek in a scene that most people would probably rather forget (but I was forced to endure it this week, so YOU WILL SUFFER WITH ME). It is generally the craziness that endures, largely because it seemed more naturally Eleventh Doctor than the darkness that occasionally crept in (and which characterised much of his later run). That’s not to do any sort of disservice to Smith, equally at home with both facets – but only one of them was fun to watch. If you examine the archives you’ll also see plenty of descriptions of the Eleventh Doctor that tie him inexorably to the Second: a man who seems to be in his own world until the moment he does something brilliant. The Doctor’s seemingly desperate act in the closing moments of The Web of Fear is really a ploy to destroy the Great Intelligence (a plan that fails, ironically, because his companions don’t fully trust him, albeit with the best of intentions). Fast forward a few hundred years and the Doctor’s bumbling in The Almost People is the greatest of fronts: a doppelganger pretending to be the real Doctor, and vice versa, fooling even the people who think they know him best. Indeed, it’s only when we actively see the Doctor in full control that it swiftly becomes apparent that he isn’t – and if there’s any lesson you should take from A Good Man Goes To War, it ought to be that one. There’s a certain amount of selective memory at work here, of course. The idea of the brilliant, bumbling buffoon may have been pioneered by Troughton, but Tom Baker employed similar machinations and McCoy made it a trademark. Still, there’s something unique – and yet strangely familiar – about the way that Smith does it. It’s the hair, perhaps. Or the way he builds stories to the brink of disaster and then sweeps away the rug, Moffat’s title of choice for his first episode not so much a wry pun as a manifesto. Or the way he suddenly drops into serious mode, comforting a distraught Alfie Stormageddon, Dark Lord of All with a parental flair that casts Tennant’s throwaway, fan-baiting “I was a Dad once” into new light. Most of the Doctors have their fair share of Speeches of Reassurance, but when it’s from someone as frivolous as the Eleventh, it’s hard not to compare it to a particular scene from Tomb of the Cybermen. So a Second/ Eleventh story, while a tempting prospect in the hands of the right impersonator, is probably best consigned to the archives: it’s far more fun to team up Smith with the likes of Baker or even Eccleston, for the same reason that red works with green but does not work with purple. (And yes, Day of the Doctor works beautifully, but that’s largely because Tennant and Smith have comparatively little time together before the War Doctor shows up, which cranks the quality of the dialogue up several notches.) The Eleventh Doctor works precisely because Smith builds on the character of his distant cousin, not so much sorting wheat from chaff as evolving both of them into a sort of grainy hybrid with a character and a flair all its own. In other words, it works because it’s the same but different – and as good a metaphor for the success of this battered 53-year-old show as you’re likely to find anywhere. Of course, there’s always this. Yes… This would have been lovely.